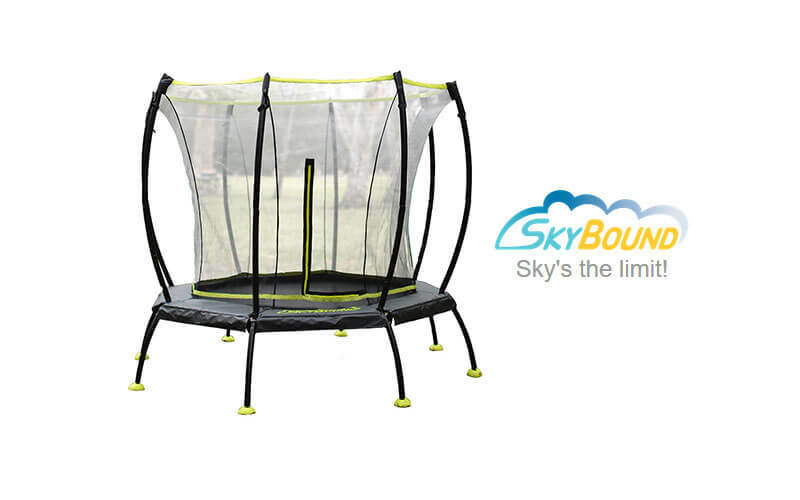 The SkyBound Atmos trampoline looks sharp and we really liked its new design. Those great green details look very exciting, plus, it has the uncommon octagonal shape going for it – in the sea of round trampolines, this is a welcome breath of fresh air. 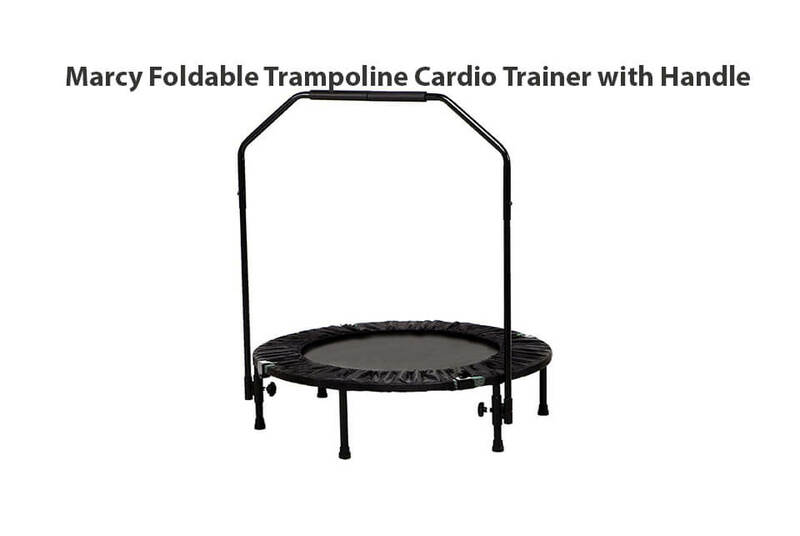 The manufacturer recommends that ages 6 and up use the trampoline. Maximum rated weight is 175lbs. This is more than enough for the intended audience. 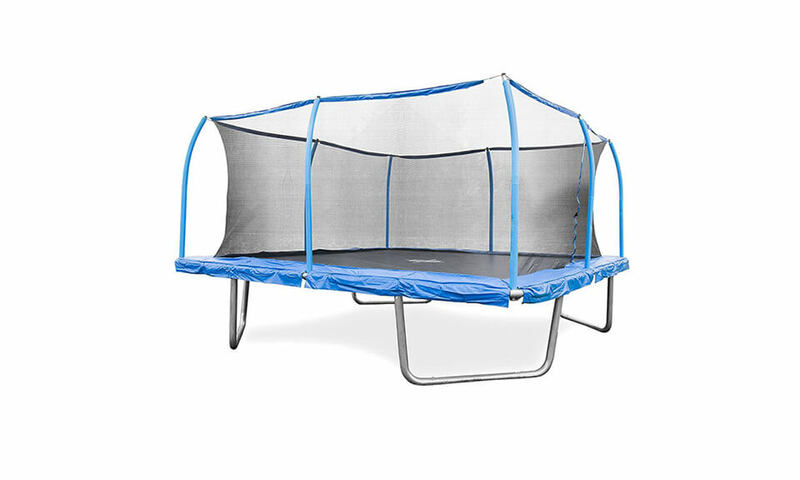 The trampoline is 8ft in wide and, as we said, it has an octagonal frame but jumping surface is round so falls into category of “round trampolines”. Skybound says it was designed with smaller spaces in mind, and we can agree with them. It fits into cramped and small garden spaces pretty well. We feel it’s the perfect size for younger children or even teenagers. The frame is made of steel, which means it should be sturdy and strong. It is. The steel is also powder coated and galvanized. This helps prevent rust and corrosion from damaging the trampoline – which can severely shorten its lifespan and present a safety hazard. They are so sure of the quality that they give a 10 year warranty on the frame. The legs of the trampoline are ball-joint welded and provide very good security. 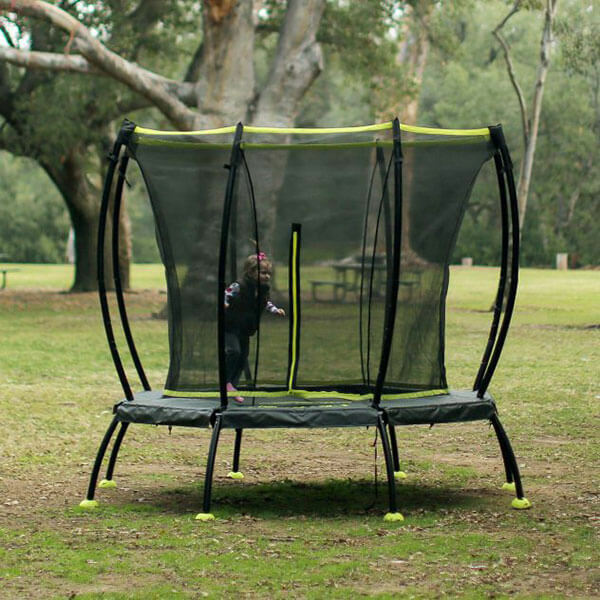 An interesting feature is that its plastic legs are pivotable, which means you’ll be able to set up your trampoline even on surfaces that are a bit uneven. Because of them, the trampoline won’t tilt during use. The safety pads, which cover the springs, are coated with UV resistant vinyl helps prevent early deterioration from solar radiation, which is an issue with outdoor trampolines. 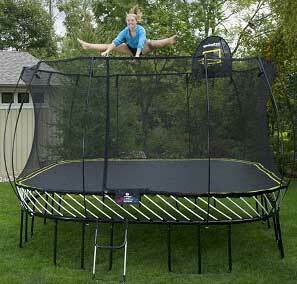 The trampoline is designed to meet or exceed the US trampoline safety requirements. The enclosure is superbly made. 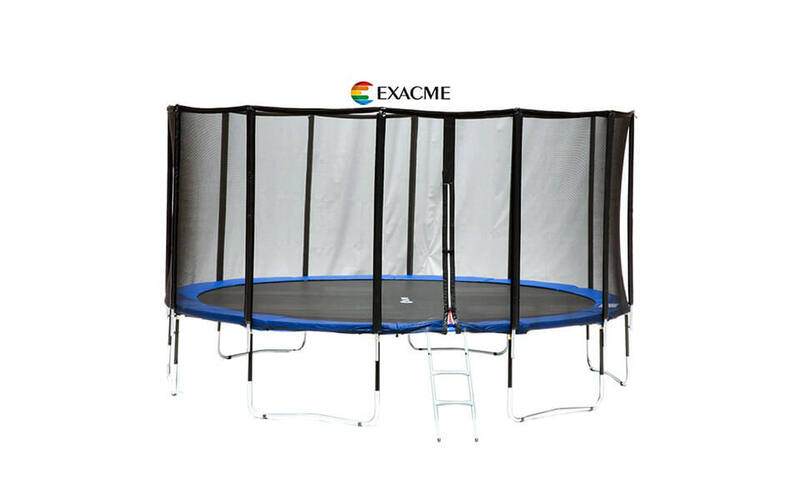 The shape is such that the enclosure protects the user from ever missing the jumping surface, since it attaches to the trampoline mat, instead of just encircling it. This is a great safety solution, which makes the trampoline as safe as it can get for children. Such a setup greatly reduces the risk of injury from contact with springs or the steel frame. The net is also made of UV resistant materials. The enclosure poles have a soft foam layer, which provides an additional layer of security. Warranty offered by Skybound is extremely good. We were amazed by the 10 year warranty on the frame which really is, as the company states, “industry-leading”. Other parts come with a shorter warranty, but it’s still fairly good. Springs, enclosure net and all other parts come with a 1 year warranty; except for the safety pads, with have a 6 months warranty. 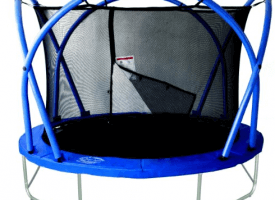 The octagonal shape allows the trampoline to better distribute the weight and forces across the whole surface. 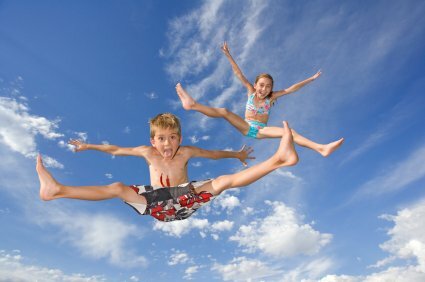 This helps with the jumper’s balance, which is especially important for children, whose coordination isn’t as developed. We felt that the trampoline itself is really safe, and the bounce is just as it should be for children. 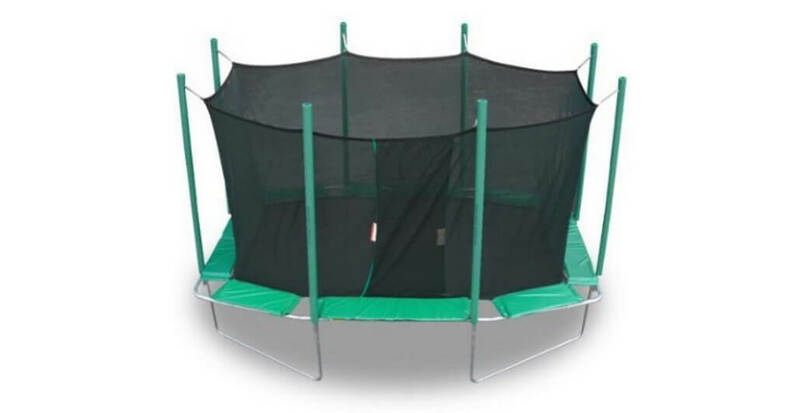 The trampoline is fairly easy to set up and get running. The enclosure net has a sleeve that you place onto the pole and secure with a Velcro strap. It’s quick and convenient. 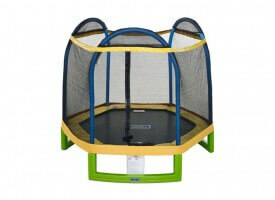 Overall, we think the SkyBound Atmos 8FT Trampoline is a great choice. Its price may be a bit higher than the competition, but we were swayed by its pivotable legs and high quality enclosure. These quality legs also ease set-up, as it can be placed even on uneven surfaces. The design is also good; dynamic and the opposite of boring. At all times we were confident in the safety of this trampoline. 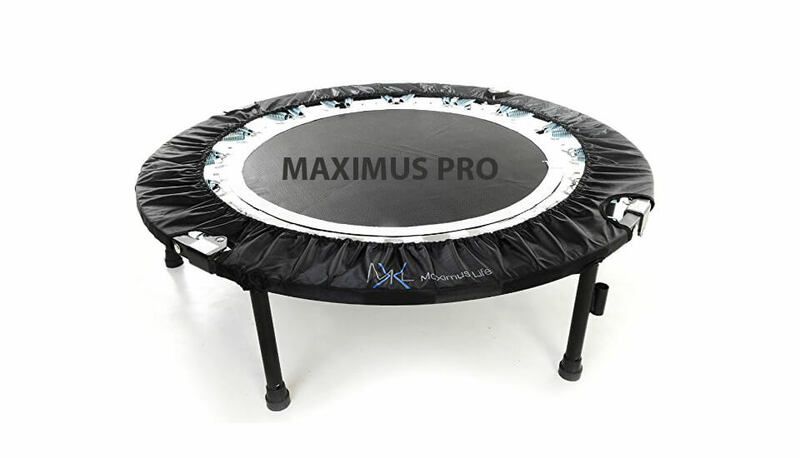 The warranty is also fairly good, but we reckon that you won’t be needing it, as the trampoline is made of high quality materials, especially the enclosure. 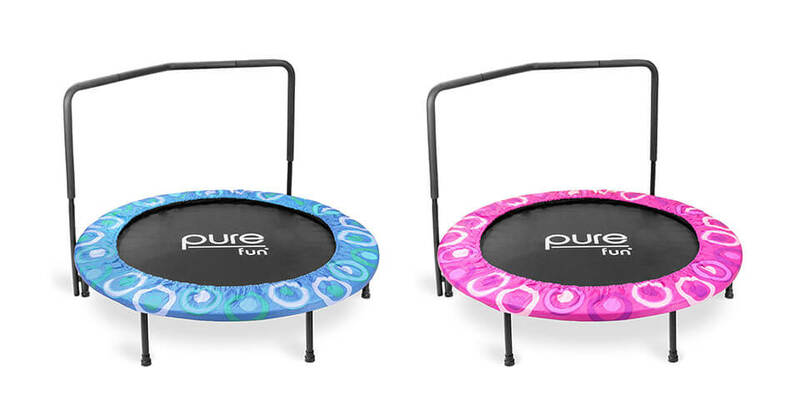 SkyBound did indeed succeed in what it set out to do – it disturbed the status quo in the trampoline market and made a great new product just in time for this year’s trampoline season – there’s a new face in town. 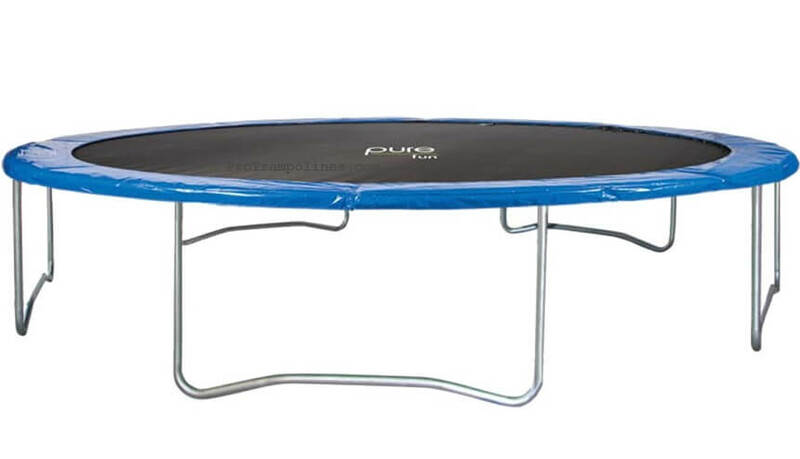 If you’re in the market for a children’s trampoline, you really can’t go wrong with this one! 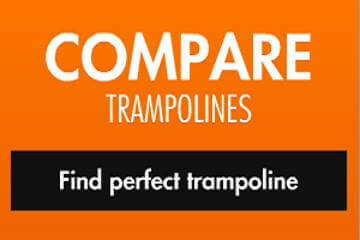 Very good trampoline primarily made for younger children. 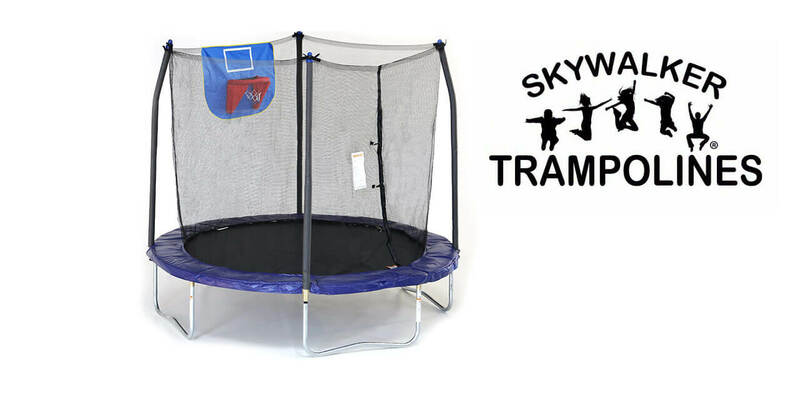 This is new, year 2016 version of SkyBound trampoline so expect nothing less that great! Recommended trampoline.